Lately we’ve been writing about why we expected the rebound in precious metals to continue without any serious setbacks. After a major low, sentiment can remain muted for several months even in contrast to the improving market action. Yet, a look at history shows that rebounds from major lows can continue unabated and unscathed for more than a year. The rebound in precious metals thus far appears to be following this script. It has received a further boost with the breakout in Gold yesterday and as of now, the breakout in the gold miners. First, let’s take a look at Gold. The chart below highlights the importance of $1,350-$1,360 which was major trendline resistance since April 2013 and November 2012. With the breakout past $1,360, the next key target is $1,420. Gold has weekly resistance at $1,400 so keep that in mind as well. If Gold can takeout $1,420 convincingly on a weekly basis then it could have legs to $1,500. 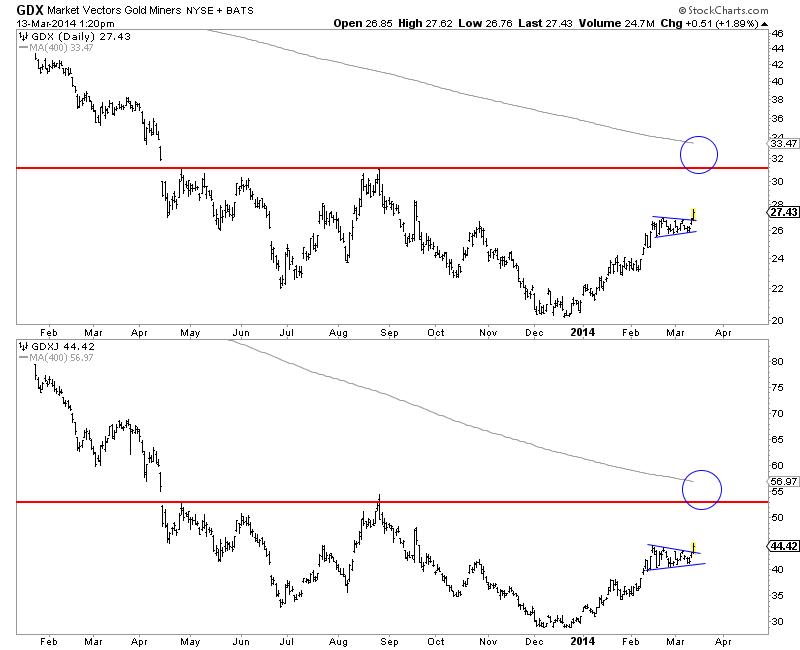 Today we have the gold miners, both GDX and GDXJ breaking out of their consolidations. For several weeks both markets held in tight consolidations which appear to bullish flag continuation patterns. GDX’s upside target is $31 while GDXJ could reach $53. The 400-day moving averages could intersect with these targets to form strong resistance. 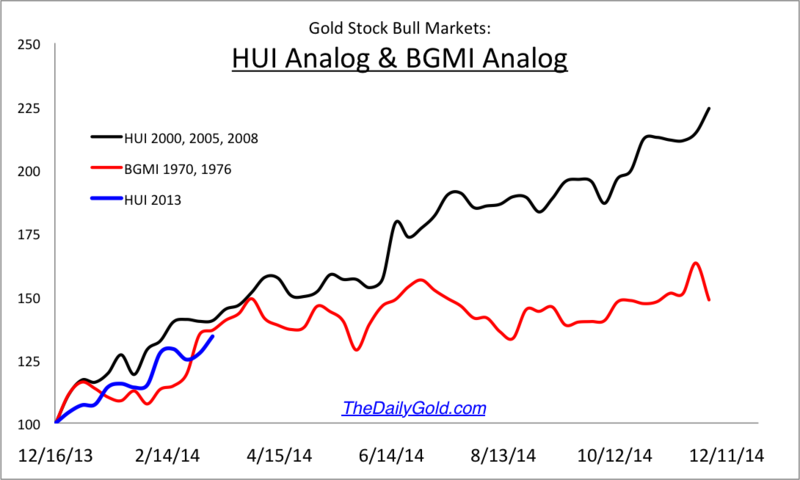 The gold stock bull analog chart shows that this current recovery in the HUI Gold Bugs Index is very much in-line with historical recoveries. The current recovery is in blue. Last week we wrote: It is incredibly difficult to buy at this juncture but, as we noted in our last editorial, the evidence favors doing so. Pullbacks, until we see much larger gains should be brief and should be used as an opportunity. ETFs such as GDX, GDXJ, and GLDX have spent the last 11 days consolidating and digesting gains. When the market evolves according to your thesis you don’t do anything. You sit tight until you decide to take profits or something changes. 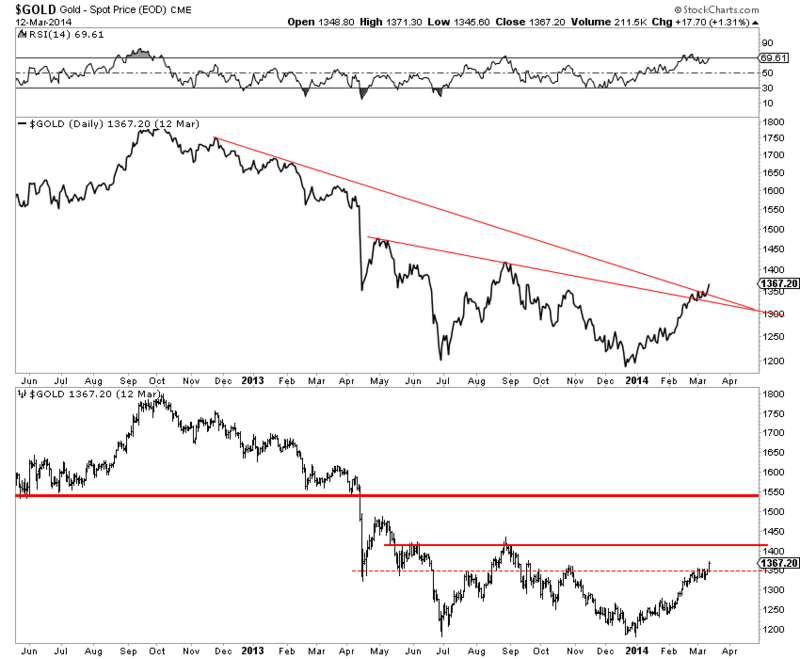 Considerable near-term upside potential remains in play for the gold stocks. Silver and the silver stocks have lagged in recent weeks but they will perform well if this breakout is sustained as we expect. As the previous chart shows, there is potentially a lot more upside in play for the balance of the year. Be long, sit tight and have an exit strategy (to limit losses) in case things play out differently.